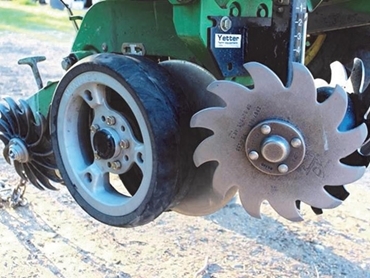 Manutec has developed a new range of gauge wheels for single and double disc seeders that would solve some of the common problems being encountered on Australian farms. Working with Australian manufacturers and farmers over the last four years, Manutec sought to address the problem of removing clay and mud from the discs of single disc machines as conventional scrapers were not effective. Softer or more flexible tyres were not the solution as they were being damaged by hard stubble, and they just smeared the clay and mud on the disc surface. Manutec devised a new solution wherein a scraper blade was built into the tyre face that was in contact with the disc. This blade would ensure 360-degree removal of mud and clay as the tyre rotated on the disc. The first wheels proved to be very effective and increased productivity considerably for many farmers. Manutec continued to develop the new Mud Razor gauge wheels to suit double disc seeders, and also to solve the plugging problem on MaxEmerge machines. The MaxEmerge provided a considerable challenge as weight had to be kept to a minimum, making the steel scraper face or solid rubber tyres unviable. Manutec investigated whether the same result could be achieved using a hardened rubber face on a lightweight semi-pneumatic tyre and then incorporated this onto a lightweight vented alloy rim. This combination allowed them to minimise weight, remove a higher percentage of mud and clay, and also provide a venting system through the rim for mud and trash to flow through. This development led to hybrid wheels for the JD1860 and 1890 machines, which combined the features of both earlier wheels into two new gauge wheels. Key features of the new wheels include stubble/stone resistance; anti-plugging flow through vents; steel scraper face incorporated for mud and clay removal; available in 3” and 4” tyre widths; easy to fit with plenty of wear adjustment; and multiple hub and bearing options, including a John Deere 5203 KYY2 option.